Starting kindy or school is an especially big step for any child, but it can be even more challenging if your child has a chronic medical condition like an EGID/EoE or food allergies. Ideally before school starts, discuss with your school principal/deputy principal, class teacher and teacher aide any extra care requirements your child may have and put appropriate plans in place. For EGID you can supply the school with a Medical Alert Information Sheet like this one so they are aware of your child’s EGID and any extra care requirements (you can modify document to suit individual needs). You can also order some of our EGID medical brochures to take to the school. If your child is tube fed or will be formula fed at school, discuss where and how your child will be fed and what happens during meal times. Do not be afraid to offer alternatives if you are not comfortable with the plan that is being proposed. Every situation is different. If your child is following an elimination diet and/or has severe food allergies bring some 'safe' treats in on the first day for the classroom freezer so treats can be available as required so your child doesn't get left out of special treats and class celebrations. Even better if you can discuss with the teacher about the whole class having non-food treats! Cooking in the classroom often comes up and this will be your opportunity to offer alternatives, such as egg free baking or gluten free etc., Most teachers will welcome different ideas of what they can do in class and if you or a family member can assist, that may even be better! Talk with your child. Reinforce the importance of following all the "food allergy rules" you've taught them. It is also important to speak about 'handover' plans when there may be a substitute teacher in your child's classroom as many of the staff may help in your child's class from time to time. If also living with severe allergies visit your child's Allergist or GP for an updated Anaphylaxis Action Plan. Refer ASCIA website. Supply school with medicines that may be required throughout the year including EpiPen/s if severe allergies are involved. Schools will usually require a form to be completed (from the school) for each medicine and each medicine will require pharmacy label attached with your child’s name (even for non-prescription items like antihistamines). Make notes of the expiry dates so you know when you need to replace them during the year. Check out the range of medical bags, medical id bracelets and allergy awareness stickers from the online stores listed on our Allergy Products page. MedBag offers a member discount to ausEE Members. If your child would like you to, you can order one of our books from our gift shop and bring it into the school to read to the class for 'show and tell' to help explain EoE to classmates. They are only $8 each! Make yourself available to parents and staff including those running the canteen and the P&C. Give them your contact information so they can call you with questions/suggestions/or concerns. Recognise up front that this is a learning process for everyone. Think back to when your child was first diagnosed and how little you probably knew about their condition and food allergies. Remember that things that are second-nature to you now, like reading ingredient labels, won't be immediately so for others. Be a frequent visitor at school. Here is an instance where "face time" matters! Volunteer at the school if you can. 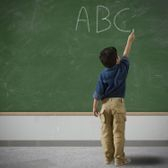 The above will hopefully help to prompt you on the steps to starting the school year but it is not exhaustive. There is a wealth of information on the My Food Allergy Friends website. Allergy and Anaphylaxis Australia is an excellent source of information including a School Resource Help Sheet section on their website. We wish everyone a great start to the school year! 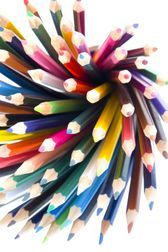 A reminder for when you order your back to school supplies that ausEE is listed as a fundraiser with Bright Star Kids. When placing your online order simply click on LINK A FUNDRAISING ACCOUNT in the checkout and enter ‘AusEE Inc’. This supports our charity as ausEE earns a 15% commission from all sales. Please share this information with your friends and family as every dollar helps our cause! 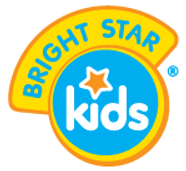 Bright Star Kids sell more than name labels, you can also purchase lunch boxes, drink bottles, school bags, personalised gifts etc. They often have great sales on their website too! 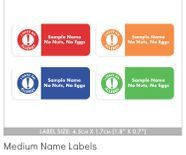 An idea for when you order name labels is to buy the bigger ones that allow two lines and have your child’s name on the top line and list their allergies/medical alert on the second line. They do have some allergy specific icons available and you can also buy packs of Allergy Alert round labels which are great for lunch boxes, drink bottles, food containers etc.